I have been reading P.W. 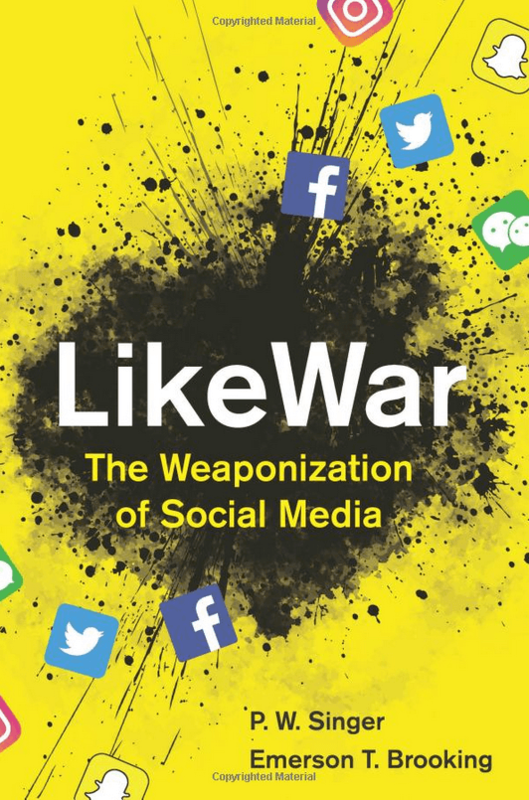 Singer and Emerson T. Brooking’s new book LikeWar: The Weaponization of Social Media. 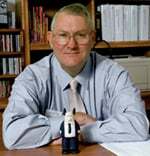 Tuesday evening, I was able to attend a talk that Emerson Brooking gave at the Robertson School of Media and Culture at VCU. They recorded the talk, and I will add that at the bottom of this post. It is worth the hour! It is interesting that the book weaves together stories from three very different aspects – The Trump Presidency, ISIS, and Russian influence – and then shows the similarities in how social media was used to sow unreality as reality. They noted their common use of 4D’s: “dismiss the critic, distort the facts, distract from the main issue, and dismay the audience”. #EDU6323 Interesting that our discussion this week began with how we can help build individual responsibility among our students on the internet, but then many declare that government oversight is what is needed. Does anyone else see the inherent contradiction in these 2 ideas? Another student tweeted a link to a news feed called AllSides – that supposedly provides news from a left, right, and central point of view. I had not heard of this…and immediately wonder what algorithms are at work here! And maybe that gets at the heart of LikeWar. We used to have a sense of what could be trusted. Now, we have gone from being critical uses of information to being critical of every source. In some ways, that leads to chaos…which the enemies of the democratization of the world embrace. 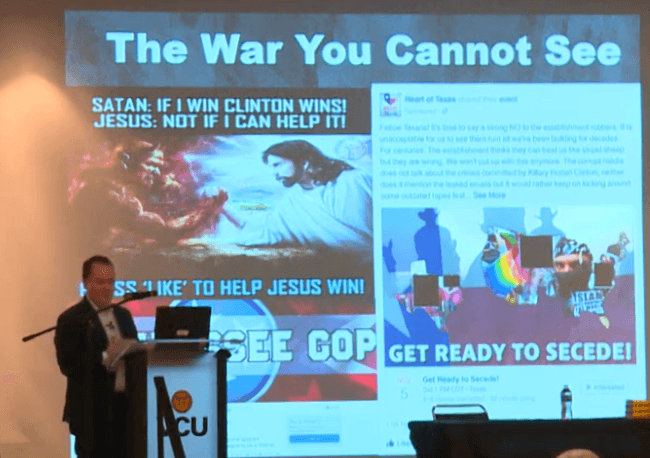 In Emerson’s talk, he showed some examples of Facebook screens from before the 2016 election that were widely shared. The Click “Like” to help Jesus, the supposed Tennessee GOP FB Group, and the Texas secede pages were all created in Saint Petersburg by the Russian disinformation campaign. Emerson noted that some 60% of people that share links have never actually clicked on the link themselves to see what they are sharing…they are just going off the headline. The optimist in me remembers the chaos right after the shootings at Virginia Tech in April 2007. I was working out in the VCU gym when I noticed a large number of students suddenly texting on their phones. I glanced at the TV and noticed the breaking news. At first, the “facts” were hard to decipher, but interestingly, one source quickly rose to the task – Wikipedia. Over a three day period, the Wikipedia post grew from a few lines to three pages of tight information. Rumors were posted and then fact-checked and either updated or removed. The Wikipedia page had better and more up-to-date information than any of the major news media sources. We live, learn, work, and play in a web-infused world where reality and unreality co-exist. I am struggling to figure out the best way to help my students (and their students) navigate this new landscape. I would like to believe that humankind can – like we did during the Virginia Tech shootings – rise above the negativity and polarization that seems to grip the world today. But the examples of Donald Trump, ISIS, and Russian disinformation show the dark side of the world. I would be interested in your thoughts! How do you work with your students to separate reality from unreality? In an online class I’m helping design right now, we help the learners develop their problem-solving skills by first asking them to gather facts, like an investigative reporter. It is amazing how hard that one act can be. Just facts. From the place they work. From processes they touch every day. Helping adults with that one small act, deciphering between fact and opinion, between subjective and objective, is one way that we are attempting to improve our adult professionals’ problem-solving skills. My hope is that it also impacts their lives outside of work. Yes! And how not “small” or easy it is. Acknowledging the struggle for us mere mortals to decipher between true/false/and the grey area in between I believe to be a key step to learning and to opening up a window that allows new ideas and perspectives in.